Metrorail has had a huge impact on the region, but as we’ve seen with the Silver Line, it can take decades to get from concept to execution. One of the questions I hear most often as a planner for Metro is When will a Metro station open in xyz neighborhood, “in Georgetown”, or “at BWI”? It was the first question at the March Citizens Association of Georgetown meeting. My response — “Decades” — often elicits audible groans. Given last summer’s opening of the Silver Line, we have a case study that can provide insight on how long it takes to plan, fund, and construct large infrastructure projects. 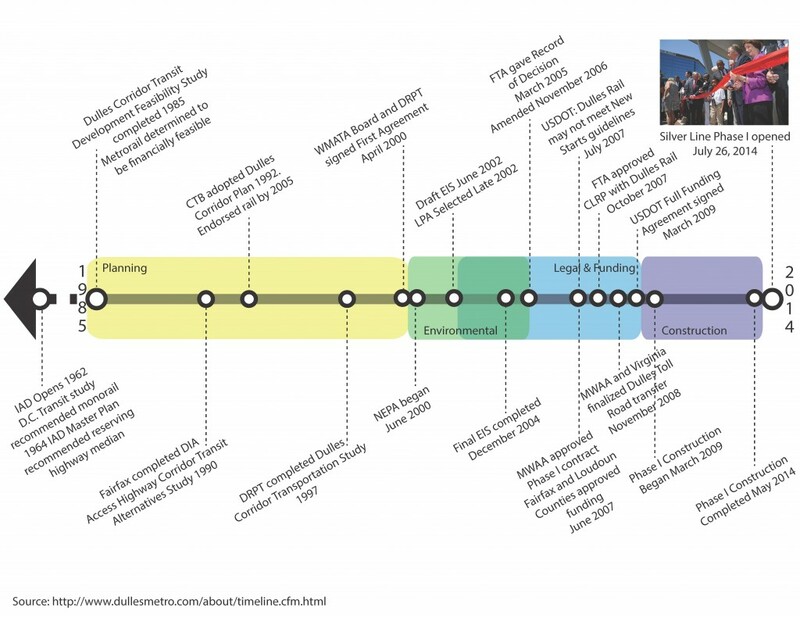 The Dulles Corridor Metrorail Project has done a phenomenal job of maintaining a project timeline. Since the region has many recent newcomers, it is helpful to revisit many of the key milestones, as shown below. It is also helpful to remind readers that the Metropolitan Washington Airports Authority (MWAA) was the ultimate developer of the Silver Line (both Phases I and II) and that the project “only” required cooperation among the Commonwealth of Virginia, MWAA, Metro, the federal government, and Fairfax and Loudoun Counties. While just one example, the Silver Line’s long story is not vastly different from other mega-projects happening in the region and across the country. 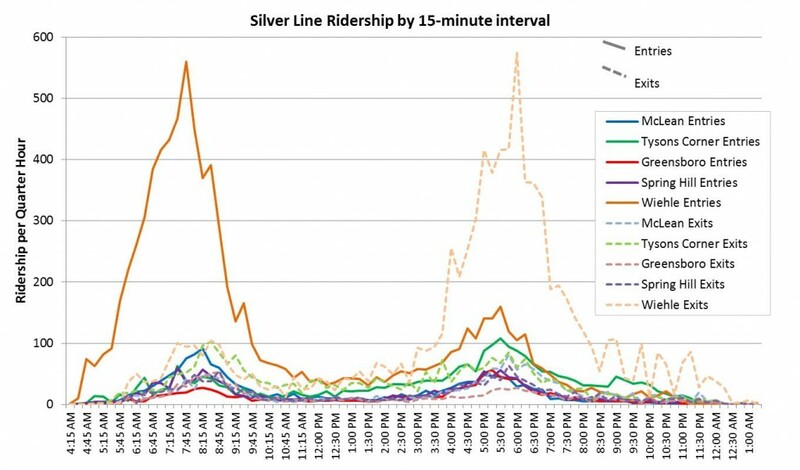 Silver Line Ridership Patterns – Visualized! 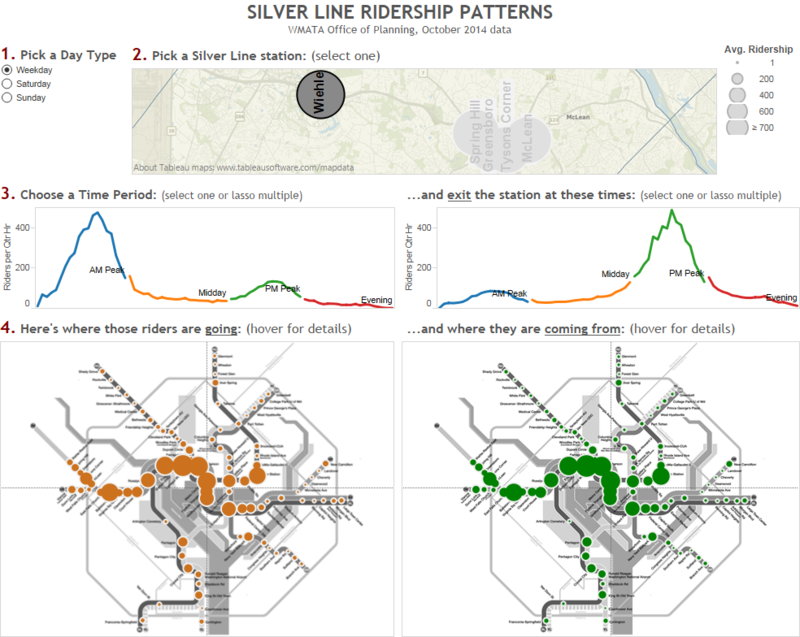 Learn about the travel patterns of Silver Line riders in rich, interactive detail with this new tool. Click on the dashboard below to see where Silver Line rail riders are going, coming from, and by time of day and day type. This is simply a visualization of the October 2014 rail ridership data we recently posted. What patterns do you see? What jumps out at you? 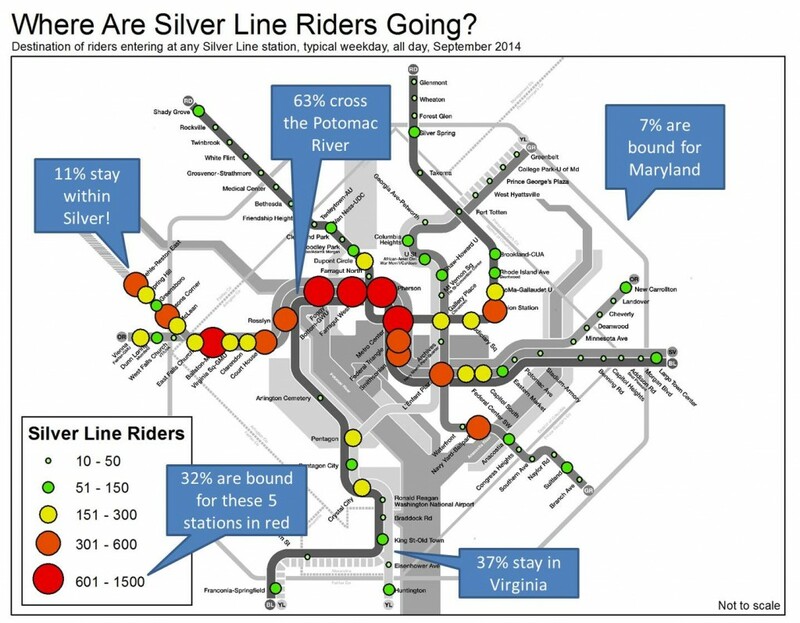 This new data download from October 2014 includes ridership from the five new Silver Line stations. Over the past few years we’ve been making ridership data available for download and analysis by the online community. We have received some requests for full origin-destination (O/D) data sets that include the new Silver Line ridership. These data sets include ridership from October of 2014, and are available by period (AM Peak, midday, etc.) or by quarter-hour interval, for all stations including the five new Silver Line stations. Both sets include daily averages for weekdays, Saturdays, Sundays and Columbus Day. Note, the quarter-hour data file is to big to open in Microsoft Excel. Have fun playing around with this data and let us know in the comments what you find. Make sure you check out the other assessments of Silver Line ridership we’ve done. Jan 29, 2015, 10:00 AM Update: Files have been updated to include total and average travel times for each station pair. Feb 02, 2015, 11:00 AM Update: Files have been updated to separate Columbus Day from Saturdays using a new column “Holiday”. The four new Metrorail stations in the Tysons Corner-area of Fairfax County illustrate diversity of land uses. Tysons Corner, the archetype of an Edge City, is a mix of office towers, apartment buildings and single-use retail in a suburban, auto-oriented setting. 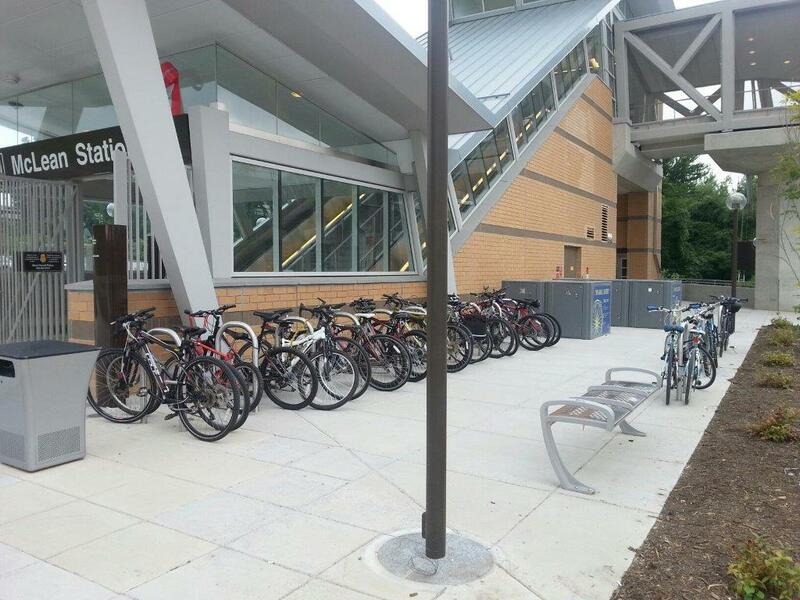 As such, one would expect to see ridership at the new Tysons-area stations reflect the diverse land uses. Ridership data (station entries) from October, 2014, illustrate this perfectly. This station shows more AM Peak entries than any other time period, showing its station area is more like a typical “bedroom” community than the rest. However, very strong PM Peak station entries reflect many employment sites near the station, providing a near-perfect balance between AM and PM peak entries. As would be expected at stations with limited retail, mid-day and evening ridership is low at McLean. This station has perhaps the most unique ridership pattern, with PM Peak ridership dwarfing all other time periods, and evening ridership higher than even AM Peak. This station is located adjacent to two of the region’s largest shopping malls, and the ridership likely reflects both shoppers and retail employees using the station heavily throughout the day. This station has the greatest number of entries in the PM Peak. This pattern reflects the suburban employment center-nature of this section of Tysons Corner. Midday and evening ridership are significantly lower than the peaks, reflecting lower numbers of transit-accessible retail. This station is similar to McLean with the greatest number of entries in the AM Peak, reflecting large residential complexes nearby. However, this station also draws a fair number of PM Peak entries, nearly as many as in the AM, reflecting the variety of job sites within walking distance of the station. Perhaps what’s most unique about these ridership patterns is that they differ from those of the other stations in Fairfax County. Below is a graphic showing percentage of system entries by period for Tysons-area stations versus the other stations in Fairfax County. At the other Fairfax County stations, system entries are concentrated (two thirds!) in the AM Peak. Ridership at the Tysons-area stations is more diverse, with 37% of the entries in the PM Peak and another 29% in the AM Peak. These graphics and the data behind them are available for download from the Tableau Public site. What other patters can you find? Where Are Silver Line Riders Going? Ridership patterns on the Silver Line show that Metro’s new line is serving a truly regional market. Now that school is back in session, the new Silver Line just completed its first full week where “normal” travel patterns are beginning to emerge. Ridership is strong, but where are these new passengers going? The diagram below shows destinations of all riders entering a Silver Line station in the week of September 8-12, 2014. After just two months, ridership on the Silver Line is off to a solid start: Wiehle Ave is already over projections, reverse commuting is strong, and more. Now that school is back in session and most summer vacations over, here is an in-depth look at the week of September 8-12, 2014, when “normal” routines may have begun to emerge. Wiehle station is already over opening-year projections and shows the highest ridership of all the new stations. 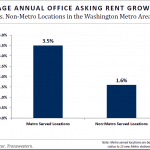 Tysons Corner station is strong as well, but we still have room to grow at all four stations located in the Tysons area. McLean (in blue) is showing an early lead as a a “traditional” commute station, where most riders enter in the morning. Greensboro and Spring Hill show relatively light ridership so far, but ridership is expected to grow over time as development catches up with the new station. What do you think? Have you taken the Silver Line on a weekday? What was your experience? The raw data by quarter-hour interval underlying this analysis is available in two formats: by station alone (2MB, .xlsx), and by origin-destination station (3MB, zipped tab-delimited .txt). 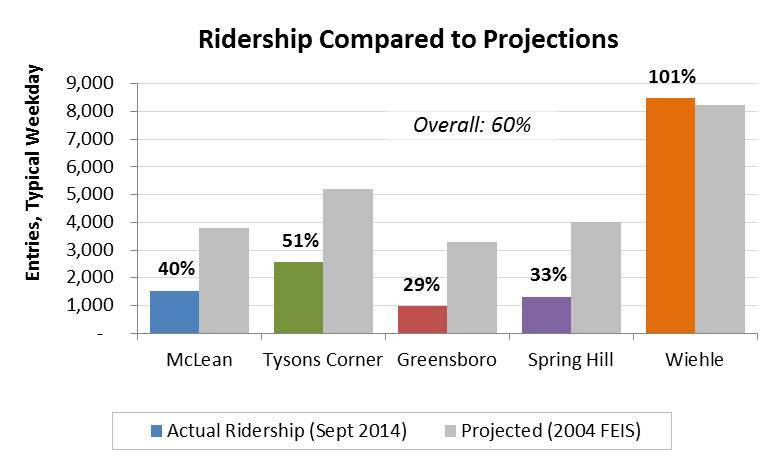 Even though Tysons Corner station on the Silver Line is only two months old, off-peak ridership is particularly strong. Saturdays are busier than weekdays, and the station stays busy past 10:00pm. 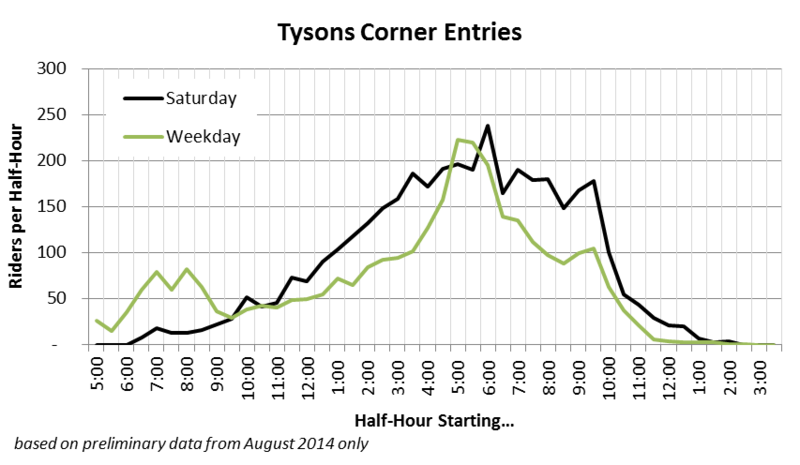 Tysons Corner station is already serving a solid reverse commute market, but ridership is also strong during midday hours, and reaches its peak during the afternoon rush and evening hours. Metro planner captures some smiles of excited Silver Line customers on camera opening weekend. 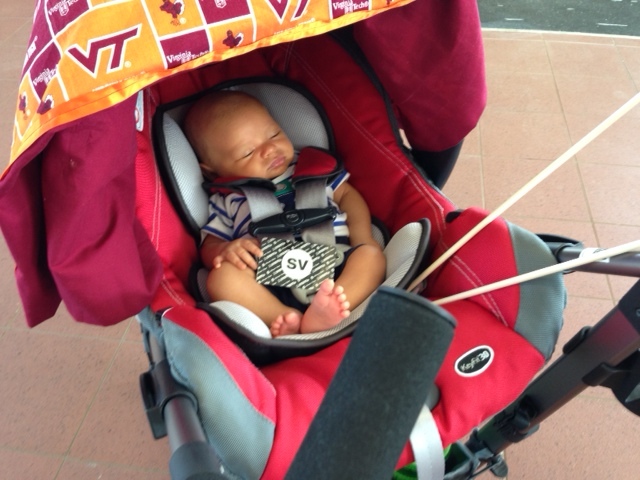 Baby’s first Metrorail trip on SV’s first day. I offered up my Saturday on a recent weekend to participate in something really cool, the opening of the new Metrorail Silver Line. Metro has a program where employees can help out during special events or scheduled trackwork to guide customers through the fare vending machines or navigate bus bridges. I took advantage of this opportunity because I knew it would be something special.